Dudley Senanayakes birth anniversary falls today, the 19th June. It was in 1967 that I first got to know Dudley Senanayake. He was then the Prime Minister and I was a university student and a member of the UNPs student wing. In the year 1967, there was some student unrest and the progovernment student unions went in a delegation to meet the Prime Minister. That was my first encounter with Dudley. After the defeat of the UNP in 1970, we had occasion to work very closely together. Dudley Senanayakes role in history has not yet been assessed properly by scholars. There is a dearth of scholars and political scientists in this country to do this kind of thing now. But even at a cursory glance, it can be seen that Dudleys contribution has been much more significant than would appear at first sight. Dudley was not a reluctant entrant into politics. But he was a reluctant Prime Minister. When D.S.Senanayake died unexpectedly in 1952, the UNP was confronted with the choice of a new leader. Most of the high rankers in the UNP including J. R. Jayewardene were apprehensive of Sir John Kotelawala who would have been the logical successor. After Dudley resigned, Sir John took over as Prime Minister. Thereafter Dudley more or less retired from politics. The party was soundly defeated at the General Election of 1956 returning only eight members to Parliament. 1956 was by far the worst defeat ever faced by the UNP. The party was left virtually rudderless. Dudley was in retirement and Sir John had virtually given up politics. The principle figure in the party after the defeat was J. R. Jayewardene. In those gloomy days, the leader of the UNPs minuscule Parliamentary group was M.D.Banda - now an almost forgotten figure, but a fine gentleman and an exemplary politician. Even though the UNP had eight members in Parliament there were only three really active members among them M.D.Banda, C.A.Dharmapala and E. L. B. Hurulle. Even though J.R.Jayewardene had emerged as the principal figure in the party after 1956, he knew that he did not have enough popular appeal to be able to get the UNP back on its feet. In 1957, he managed to persuade Dudley Senanayake to come back into politics as the leader of the UNP. JRs strategy paid off almost immediately as the party that had been so soundly defeated in 1956, won the 1960 March General Election. The comeback of the UNP in 1960 was a genuine recovery. The UNPs popular vote had exceeded that of the SLFP but they were unable to obtain enough of a majority to govern. The UNP was then negotiating with the Federal Party to form a coalition government but the demands put forward by the FP at the time were deemed to be excessive and Dudley decided to go in for a fresh election. At the July 1960 General Election, the UNP increased its vote and once more had more votes than the SLFP but due to the first past the post electoral system that prevailed then the UNP ended up with much less seats than the SLFP. The SLFPs comeback was due to the electoral system. But it was also due to the sympathy vote resulting from Mr. S.W.R.D.Bandaranaikes assassination. If Mr. Bandaranaike had not been assassinated, the SLFP would have had no chance in 1960 as their popularity had declined drastically by 1959. Author Gunadasa Liyanage in his inimitable style, has expressed this situation in his novel Gamana Nonimei as a case where the fatal gunshots of 1959 fired had killed a living Mr. Bandaranike but had at the same time, ironically, given life to a dead SLFP! Be that as it may, the SLFP formed a government in July 1960 and Dudley was relegated to the opposition for a few more years. Towards 1964, a very dangerous situation arose in the country with the LSSP joining the SLFP government as a coalition partner for the first time. There was talk of acquiring Lake House by the government and a leftist dictatorship under the leadership of the SLFP was in the making. It was in this atmosphere that the UNP under the leadership of Dudley Senanayake and J.R.Jayewardene carried out the first successful attempt to defeat a government in Parliament. One of the main figures behind this attempt to defeat the SLFP-LSSP combine in Parliament was Esmond Wickremasinghe and in fact, most of the discussions held in this regard were at Esmond Wickremasinghes house at 5th Lane Colpetty. This plan succeeded with the crossing over of fourteen SLFP MPs under the leadership of the Leader of the House C.P.de Silva to the opposition thus brining down the SLFP-LSSP government. 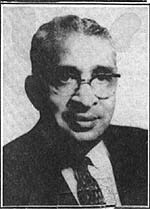 Dudley Senanayake won the General Election of 1965 and formed a government with six other partners. Dudley Senanayake was a man who could reconcile contradictions. Included in his government were Sinhala Nationalists like K.M.P.Rajaratne along with the Federal Party of S.J.V.Chelvanayagam. Phillip Gunawardene the Father of Socialism in Sri Lanka was sitting together with Yankee Dickey J.R.Jayewardene. But the government held together and was in fact the first government in post-independence Sri Lanka to complete its full term in office. In the case of all previous governments, elections had been held early and in the case of Mrs. Sirima Bandaranaikes government, had been defeated in Parliament. Politically, one might say that Dudley was a combination of a Liberal Democrat and a Social Democrat - with him politically, leaning more towards the Liberal side. On the one hand, his economic policies were those of a social democrat. He was a firm believer in democratic practices, free and fair elections, freedom of expression, respect for human rights and the independence of the Judiciary etc. In terms of economic policy, he believed in growth but not at the expense of social justice. He believed that if the poor are to participate in development, they have to be strengthened first - the landless had to be given land and government assistance to become independent. Dudley Senanayake had to bear the full brunt of the economic decline that had taken place since he had last been the Prime Minister in the 1950s. On the earlier occasion, he had been presiding over one of the more promising and prosperous countries in Asia whereas, the second time around, he found himself presiding over a country in ruins - a country that had entered the definition of a third world country. For the first few years, Dydley was almost helpless as the main lifeline of the country the plantations were in serious decline. Then he struck upon the idea of reviving the economy by an upsurge in domestic agriculture. Agricultural colonisation schemes were D.S. Senanayekes pet project. Dudley revived that interest in domestic agriculture with the inauguration of the food production drive and the green revolution. He met with unexpected success in this regard and it can safely be said that Dudley Senanayakes food production drive in the late sixties was the most successful medium term economic plan ever to be implemented in this country. Rice production alone doubled in just four years. The economic growth rates in the last three years of Dudlys 1965-70 government were comparable to the growth rates during J. R. Jayewardenes first few years in office after 1977. It was at the height of this economic resurgence that Dudley Senanayake went to the polls in 1970. Once again, due to the vagaries of the first past the post electoral system, he was defeated. It was probably after watching the career of Dudley Senanayake that J. R. Jayewardene fixated on the proportional representation system. Dudley was a very popular leader. This was why JRJ persuaded Dudley to come back into politics in 1959. On every occasion that he went to the polls Dudley always got more votes than the SLFP. In 1952, 1960 March, 1960 July and even in 1970 Dudley got more votes than the SLFP. In 1970 the SLFP got less votes than the UNP but had many more seats. They managed to exceed the UNPs number of votes only with the votes received by the other two coalition partners the LSSP and the CP. Even though Dudley was very popular among the electorate, he was not able to overcome socialist propaganda. Dudley was a gentleman in politics. He was a true democrat. His popularity among the people was revealed in ample measure by the unprecedented crowds (estimated at well over one million) that thronged to Colombo for his funeral in 1973. An aerial snapshot taken by Daily News of Independence Square at the time of Dudleys cremation shows a sea of heads as far as the eye can see - a fitting motif for the final departure of an unassuming man who led his people and ruled the country not for his personal benefit but out of a sense of duty.